I'm not sure why, but I was exhausted by the end of the day on Saturday. It may have had to do with running in the morning and then doing a hike in the afternoon. It could also been due to the fact that I'd done eleven workouts over the prior twelve days. Either way, I slept reasonably well last night and had no trouble getting through an elliptical session this morning. It was the 12th workout of my holiday break. 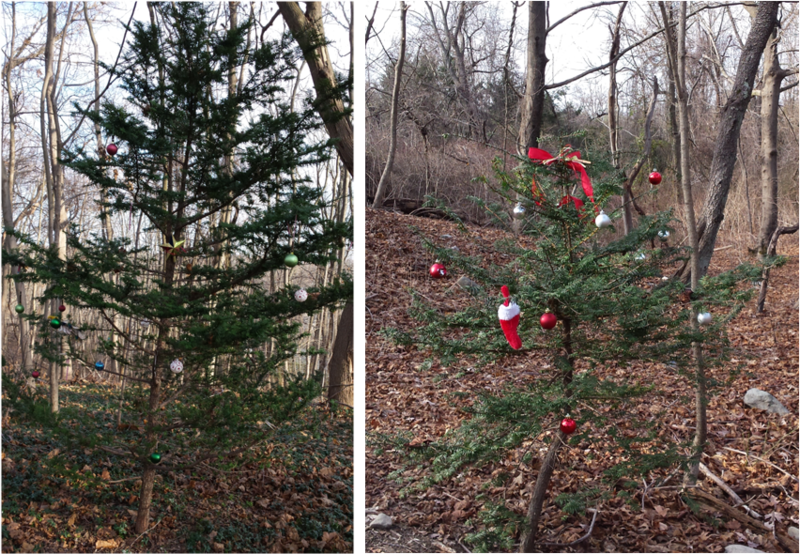 Yesterday my son and I headed over to Trailview State Park to hike the relatively short, but fairly technical trails. 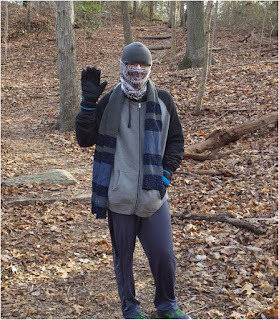 He and I have been hiking there since he was in grade school. Over the years, our conversations have progressed from silly topics related to sci-fi and robots to fascinating and challenging discussions about science and politics. We still occasionally talk about sci-fi and robots. 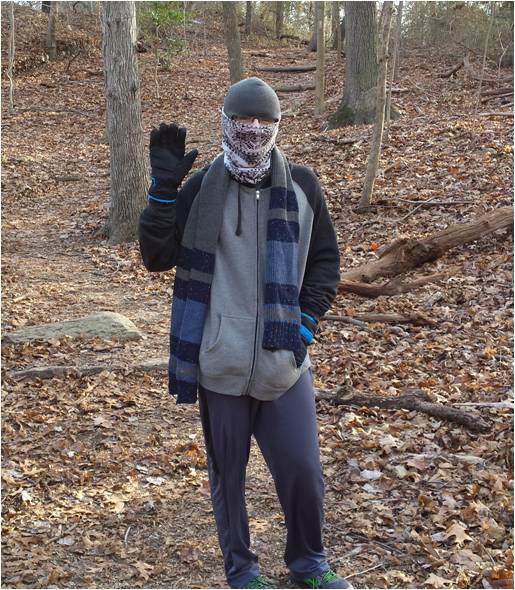 Did I mention it was cold on the trail? 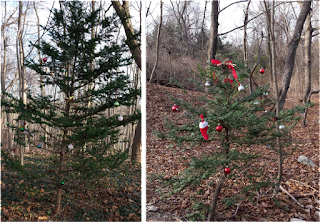 Along the way we encountered a couple of trees in the woods that people had decorated with ornaments. That was unexpected and funny. What wasn't so funny were the two large dogs that were running around unleashed, one with a GoPro camera attached to its back. I mentioned to the owner that the dogs should be leashed (actually dogs aren't even allowed in the park) and he gave me attitude. Not that I don't like dogs, but some people are afraid of them and it's obnoxious when people let their dogs run loose because they're supposedly friendly. A big dog ran up and knocked over my daughter in Stillwell Woods when she was little. That was a terrible experience for her. Today is the last day of a long vacation and I've had a great time away from the office. Reality will hit tomorrow morning when I'm back to my long commute. My 2015 running mileage suffered greatly due to a few periods when I used the elliptical or alternative cardio machines while I recovered from my disc problem. I'm hoping that I can surpass 700 running miles in 2016 and supplement that with regular elliptical workouts. My schedule won't make that easy, but I'll do my best. Love dogs. Hate dog owners. I hear you, but to be fair, I frequently encounter dog owners on the Bethpage trail who walk with leashed dogs. Some even hold their dog's collar when I run past. Woof arf bow wow. Wow. I put that through Google Translate > Dog to English: Another great post from ER. Wow."